This morning is overcast. Normally, this is not an unusual observation in Seattle, but after the most glorious end-of-summer and start-of-fall we have had, ever, I am noticing. The warm sunshine, blue sky and crisp evenings have been such a gift. Now that rain appears imminent and the air turning chilly, thoughts are emerging of a warming bowl of stew and getting cozy around a fire. I can’t resist a bowl of grains and greens. In fact, I will choose this over a bowl of beef stew (much to my family’s wonder). 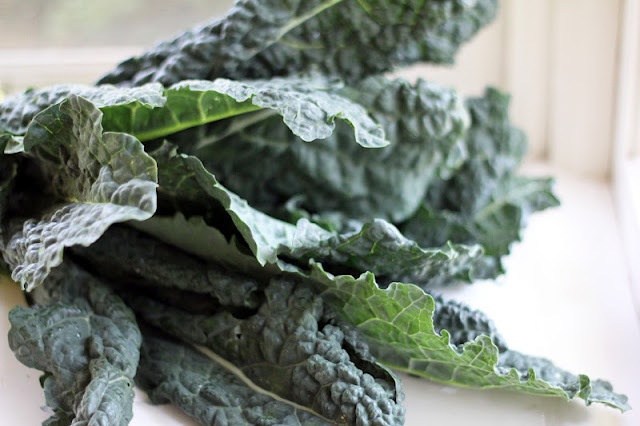 Given my love of kale, I frequently sauté a bunch or two with garlic and a little spice to enjoy as a side dish, or top it with a fried egg for a quick supper. Sometimes I may toss in leftover brown rice, too. In my opinion, grains and greens pair wonderfully. With this in mind, I began thinking about a hearty stew. I always enjoy a bowl of comforting polenta, and stirring in my quick supper of kale, onions, garlic and chiles seemed a natural fit. For some protein, I added chickpeas. I’ve been inspired by Emmy (she writes a lovely blog with daily recipes I guarantee you’ll want to eat!) to cook a pot of chickpeas more often. This means I have a stash of these cute little legumes in the fridge or freezer ready to pop into a soup or salad, or to roast for snacking. I also save the cooking liquid to use wherever broth is called for, making it ideal for preparing the polenta for this stew. The change in weather is eased by a bowl of Kale and Polenta stew, with a drizzle of balsamic vinegar adding the final touch. Frankly, I need more time to read, too - I’m in the midst of Wicked in anticipation of seeing the show here next month, and am having a hard time putting Japanese Farm Food down. I’m happy to come inside. In a large soup pot, warm the olive oil over medium heat. Add the onion, garlic and carrots and stir to coat. Let cook until the veggies soften, about 5-6 minutes. Season with salt and pepper and a few shakes of crushed red chile peppers. Add the chopped kale and toss for 2-3 minutes, until it begins to soften. Pour in the broth or stock, increase the heat and bring to a boil. Slowly add the polenta, stirring the whole time to keep it smooth. Lower the heat and let simmer for about 20 minutes. It should be like a thick soup. Stir in the chickpeas and taste for seasoning. Ladle into bowls and drizzle a little balsamic vinegar over the top of each before serving. I saw Wicked a few years ago in CA. It's quite a spectacle! 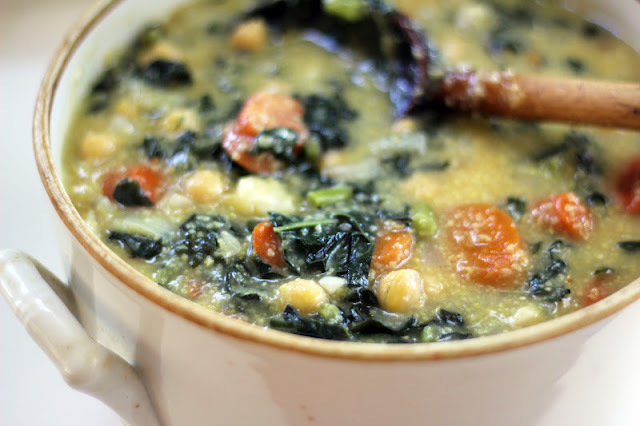 This soup looks perfect for a day like today. Looks like the rain won't start till Friday, hopefully! We need it, but I'm not ready to say goodbye!! I can't wait to see Wicked! My older son saw it in NYC last spring when he was there on a school orchestra trip. Today is even chillier...I'm really feeling fall. I agree, we need the rain, and hopefully we'll have a few more crisp, sunny days before winter is upon us. It was great! I saw it yesterday. Very different from the book. I think they just sort of took the idea and then wrote a whole new story. Which is good. The book didn't make feel good like the show did. Enjoy! This stew looks perfect. Polenta is a genius way to thicken a stew/soup. Kali - I just finished reading the book and started asking my son questions (he saw the show already. Sounds like it's quite different! I can't wait to see it. And thank you for your kind comment! I'm about to reread the first three books of the Wicked series because I finally got a copy of Out of Oz, the final book in the series. Wicked is one of my favorite books ever. I've never seen polenta in a stew before. What a neat idea! I'm with you on fall stews, Eileen! And I agree, I like kale in soups. It's such a hearty green and holds up well. Lots to enjoy this season! I love kale yet I've never used it for stew yet. I must try this one. Ohhh the Japanese Farm Food! I just bought that too. I can't wait to read it for inspiration!! I hope you enjoy the stew, Nami! I LOVE Japanese Farm Food - I'm reading it like a novel and marking many recipes to try. We are hosting a high school Japanese student this week (my son's host brother from his trip to Japan last year). The student's father is on the trip, as well, so we had him over for dinner last night and I made your Green Bean Shiraae. Delicious!! I just started eating kale. (That statement sounds like a crime, but at least I'm rectifying the situation.) So far it's been a sauteed type of experience, but this looks divine. And, I couldn't agree more about the weather. We've had such beautiful days and this overcast, almost misting, kind of fog, makes soup/stew sound like the best idea ever. Thanks! Sounds just wonderful, I'm with you on the greens and grains. I will often make a meal of just that. 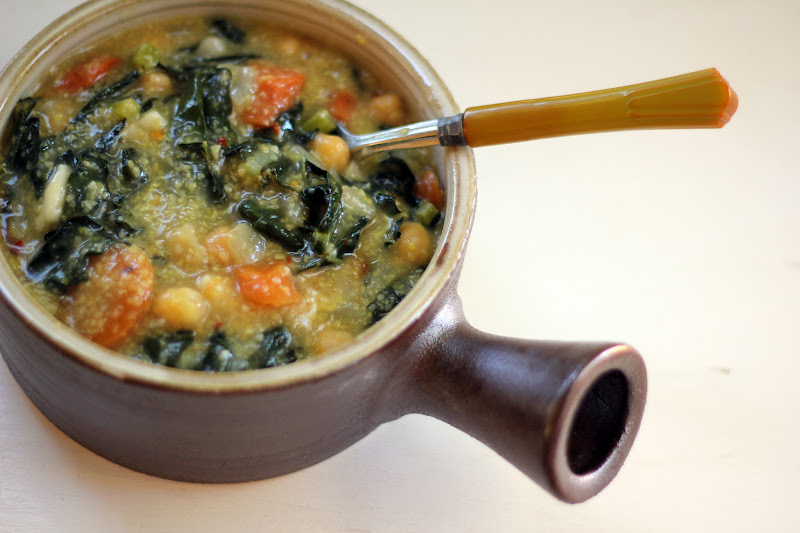 This stew is warming and comforting and embodies everything I love about this time of year. Thank you, Suzanne! There is a lot to love with this season, and stews are certainly a big part. Stay warm and cozy! My latest CSA box had MORE KALE, so my quest to love it continues! And how right you are about Fall having suddenly arrived with a vengeance...I can't say I'm looking forward to the rain and the gray, but I do love the excuse to curl up by the fire with a good book and let the day melt away. I love this idea - I have all the ingredients in the house and plan to try this most likely tomorrow night. You are such a great resource for my husband's new no-meat diet (the kids and I are not playing along but I am trying to reduce our meat intake by finding new dishes that feel just as satisfying.) Another great post Hannah! You're making me love for Fall.......Sigh. No such season to be had in Nigeria. Nevertheless, I love Kale and haven't eaten it enough in my life. Your stew is the perfect combination of comfort, and nutrition. And I like your chickpea tips, I should do the same! Thank you, KB! It is indeed a bowl of comfort to enjoy with the wind and rain blowing outside now. Enjoy some sunshine for me! I made this recipe today - needed to prepare a dish for a friend recovering from knee replacement surgery and she's gluten free, soy free and dairy free!! This is perfect. Made a second batch for me. Delicious! Aw, this make me happy, Margot - thank you! I'm delighted you enjoyed the stew. I hope your friend is recovering well. Looks so delicious! Definitely interested in trying this recipe! Wow - what a creative recipe. And how I love the story behind it. Terrific!